Returning to the small screen for the first time in 11 years, it’s not surprising that Will & Grace would have a slightly bumpy trajectory. While the first episode was painfully and overly politically tone deaf, and the second was an improvement and a reminder of the barriers this show broke in the first place, episode three—huzzah!—is the first episode that feels like the old Will & Grace. That is to say: classic, effortless instead of strained, and at times, really, really funny. 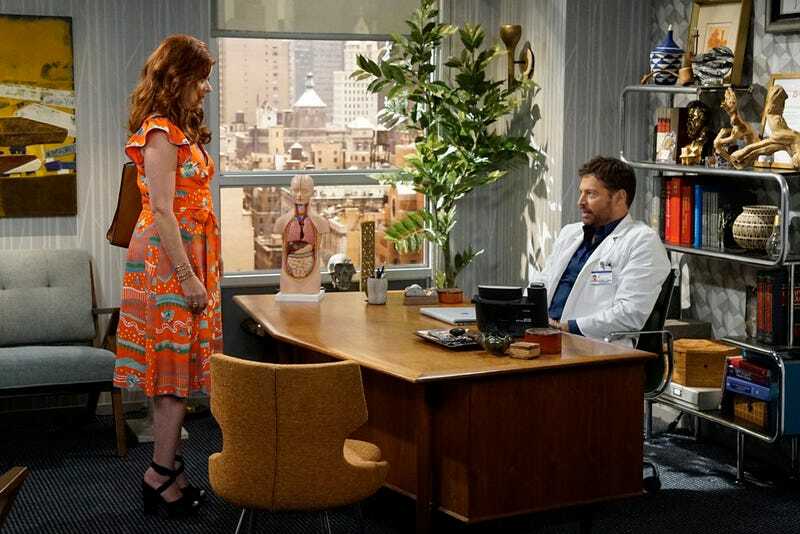 It looks like most W&G episodes are going to start off in the home base of the Will and Grace apartment, as Jack wanders in to poach food and Karen to avoid work. Still, more extensive “gaysplaining” is always appreciated, like the difference between gold-star and platinum-star gays. But this time (and maybe this is the secret), our dyads don’t split off by gender but into Will and Grace/Jack and Karen, which—now we remember—is the best of all possible worlds. First it’s fun to let Jack be “just Jack” again. “In the words of my dear friend, Amanda Bynes, ‘Where am I?’” I died. Also his inability to sell any of his jokes to a group of children. And the fact that his self-centeredness makes it impossible for him to understand anything outside his own limited purview, like Obamacare. His playing off of Bronx children’s program administrator Alvin was nothing less than masterful, as was his brutal lecturing of the aspiring actor kids. Also excellent: Karen’s sub-subplot with the young girl getting her period for the first time. When Karen started making jokes about ’59 and transistor radio, I had to look up Megan Mullally’s actual age, and was shocked to discovery that she’s 58 years old! None of us should fear aging if we wind up looking like her. And again, the brief, compassionate side of Karen is the best kind of Karen, popping up only momentarily between all of the drug references. So all the scenes in the unlikely, unfamiliar, but completely winning Bronx community center setting were well-played. There are still a few leaps that are too expected, which makes them less funny: As soon as Grace starts going off about how independent she is, of course she’s going to collapse in front of Will almost immediately. Leo’s “You have my heart” worked better because we couldn’t see it coming a mile away. Are Grace and Will weirdly close? They eat off of and pick at each other like a pair of orangutans. They know each other so well that when Grace sees Will eating bread on a non-cheat day, she knows something’s wrong, and is even able to switch her own personal trauma over to his. When you’re faced with a health scare, it’s nice to have someone who won’t judge you for eating ice cream with chicken, or tries to come up with amazing and edible crafts for you to do. The bond between Will and Grace has waxed and waned over the years, but the connection has always been solid. It was the one wrong note of the finale, now rewritten as Karen’s drug fantasy: How could Will and Grace go without talking for all those years? Answer: They never could. Obviously. And in this latest go-round, it’ll be interesting to see if they’ve learned enough to ever be able to open up their pairing to anyone else. Maybe they’ll just live together forever, chatting about Princess Diana and Camilla Parker Bowles in their adjacent suites at the nursing home three reboots from now. Hey, there are worse ways to go out. I straight-up love “Ben.” But how about a little applause for that child performance, studio audience? I had to look up “ayahuasca”—it’s a hallucinatory tea. That’s show co-producer Laura Kightlinger as Sheila the nurse, master of deadpan. This week in “Do I hate Grace’s outfit as much as Karen would?”: No way! That dress looked stunning on her. A fortunate outfit to have on when you run into the hottie ex-husband. Also appreciated Jack’s knock on idiot guys who tell women to smile. Party Down: "Constance Carmell Wedding"